This being the first of several entries about my Summer of 80’s Movies, let me first disclaim whatever I may say with the admission that I have little to no authority when it comes to what classifies a good or a bad 80’s movie. Besides, that’s not the goal. I mean, I was only 2 when The Karate Kid first hit the big screen and 12 when I first became a fan of the trilogy; what could I possibly say except I remember watching these movies religiously when I was a kid and I loved them. 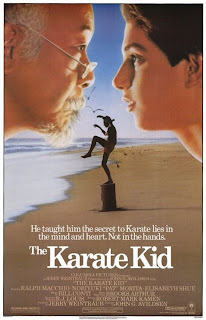 Part 1 is the coming-of-age story of Daniel Larusso, a Jersey teen who moves to the suburbs of California and meets the elderly Mr. Miyagi, his apartment’s maintenance man and, as it turns out, karate master. The story is about how Daniel overcomes the hateful rage of his bullying classmates with a defense of honor (which requires a swift kick to his opponent’s face called the “crane” technique). Elizabeth Shue plays Daniel’s “flame” as it were, but “Johnny,” Cobra Kai Dojo’s top student and Shue’s x-boyfriend, stands between them. The drama climaxes at a karate tournament where honor overcomes revenge (Daniel son lands a peaceful front kick to Johnny’s nose and is thus crowned champion). In Part 2, Mr. Miyagi receives a letter informing him that his father is gravely ill. Daniel, being Miyagi’s closest friend, goes with him to Okinawa to lend support in his time of mourning. While in Okinawa, Miyagi faces his past: a woman whom he had loved and those who had stood between them decades ago. Meanwhile, Daniel falls in love with a girl and spends the better part of the movie defending her honor. In the final fight-to-the-death scene, Daniel defends her, defeating the vengeful foe with a honk of the nose (as Miyagi modeled at the beginning of the film). In my opinion, Karate Kid’s Part 2 is typical of most part 2’s: a waste of time except as a bridge between outstanding parts 1 and 3. Part 3 was always my favorite as a kid. Daniel and Miyagi return from Okinawa only to find their apartment complex has been sold, leaving Miyagi without a job and both without a place to live. As the two are getting started on a new life selling bonsai trees, John Creasy (the bad guy from part 1) wants revenge and calls in a favor from friend and fellow karate superstar, Mr. Silver of the Cobra Kai Dojo, to destroy Miyagi and his naive student. Mr. Silver comes as a wolf in sheep’s clothing, deceiving the appetative Daniel into leaving the more passive method of Mr. Miyagi (who refused to train him for a tournament) for his own more aggressive fighting method. Of course a new girl is introduced, one who knows better of Daniel, even when he loses his way. Together, she and Miyagi try to remind Daniel of who he is, but he's caught hook line and sinker by what his new pal has empowered him to be. At a turning point, Daniel realizes his mistake and tries to leave Silver’s dojo but finds himself in the middle of a fight against three Cobra Kai masters. But don’t worry: the 180-year old Miyagi comes and beats them all into submission and then agrees to train Daniel son for the tournament. In the end, Daniel wins by a take-down/punch combo and the crowd goes wild (after having his rear handed to him for 12 rounds). The perfect start to the Summer of 80’s Movies, I must say. Next up: Tom Hanks in "Big." Seriously, who would have ever thought she would become the youngest actress ever to win a second Oscar after that movie? ?